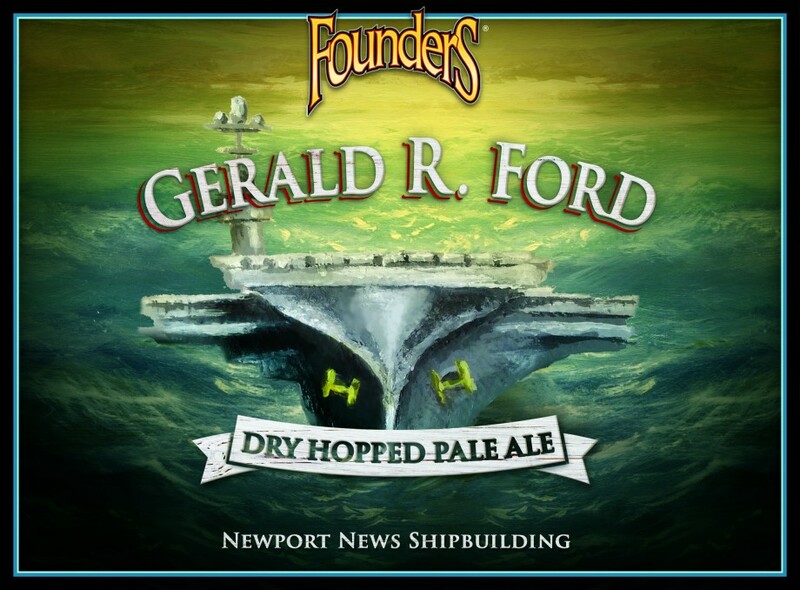 Special Pale Ale Label Created for Christening of Gerald R. Ford Aircraft Carrier - Founders Brewing Co.
Posted on November 4, 2013 by Founders Brewing Co.
We’ve created a special label for our Pale Ale in honor of the christening of the Gerald R. Ford (CVN 78) aircraft carrier, named for the 38th President of the United States who grew up in Grand Rapids, Michigan. It will also be served at a private christening dinner on Friday, November 8. The christening ceremony will be held on Saturday, November 9, at Newport News Shipbuilding, where the ship is being constructed. President Gerald R. Ford’s daughter, Susan Ford Bales, will serve as the ship’s sponsor, performing the traditional honor of breaking a bottle of American sparkling wine across the ship’s bow during the ceremony. The dry dock in which CVN 78 was structurally built was flooded, preparing the ship for launch in the days following her christening. The christening ceremony will be held in front of the ship’s bow. More information can be found online at www.thefordclass.com. The christening ceremony will also be streamed online at that site for those who want to watch from home. Any plans on turning the Gerald R. Ford special label into a Tee Shirt. As one of the supervisors that help Design the ship I would surely buy one or two! We do not have plans to turn the special label into a t-shirt, but the marketing/PR folks at Newport News Shipbuilding printed some commemorative postcards and may have extras if you’d like to reach out to them. Cheers! Will your pale ale with the Ford label be available for purchase through the website at any point? Hi There: We do not sell our beer online, and this beer was only available in bottles at the christening ceremony this past Saturday and on draft at the locations mentioned in the Newport News area. Our Pale Ale (with the regular label) is still available throughout our distribution footprint. Cheers! I would be privileged to receive a case of your Gerald R Ford beer. How might I order a case? Hi there, REJ. Thank you for your comment! Unfortunately, the special label version of this beer was only available at the christening ceremony this past Saturday. However, our Pale Ale (with the regular label) is available in Texas–it’s the same beer, just a different label. Hope that helps. Cheers! Will bottles of this beer, with this special label, be available elsewhere? I’m near Cleveland, Ohio and would love to get one. Hi William. Thanks for the comment. The special label version of this beer was only available at the christening ceremony this past Saturday. Our Pale Ale (with the regular label) is available in the Cleveland area–it’s the same beer, just a different label. Cheers! The story about the President Ford special label beer is nice. Will any be available for retail purchase here in Michigan? I would love to be able to buy some. Thanks for the comment and the kind words, Larry! The special label version of this beer was only available at the christening ceremony this past Saturday. Our Pale Ale (with the regular label) is available throughout Michigan–it’s the same beer, just a different label. Cheers! Wow, what a great tribute to our former President and the men and women of Newport News Shipbuilding. Any chance you would bottle this and make it available to the general public? Thanks for the comment, Dave! We were honored to be a part of this project. The special label version of this beer was only available at the christening ceremony this past Saturday and on draft in the Newport News area at the locations above. Our Pale Ale (with the regular label) is available throughout our footprint–it’s the same beer, just a different label. Cheers! Hi Howard–Wow, what an honor to get this comment! Could you please email us at info AT foundersbrewing DOT com? We’ll see if we can get you some extra commemorative labels. You can also reach out to the folks at Newport News Shipbuilding to see if they have any in the meantime. Cheers! Any way I can get a bottled version? I would love to have a bottle with the label! This beer was only available in bottles at the christening ceremony and on draft in the Newport News area in the locations specified above. Hi Gary–Thanks for the comment and for sharing your story! This beer was only available in bottles at the christening ceremony and on draft at the locations mentioned above. However, our Pale Ale (same beer, different label) is available throughout our distribution footprint for you to share with your family and friends. Cheers! My name is HM1 (SW) Nicholas Richards and I am stationed on PCU Gerald R. Ford. CVN – 78, and I am also a home brewer, beer connoisseur of sorts, and a huge Founder’s fan. First off, thank you for doing this. This is one of those once in a lifetime things that few of us are privileged to be a part of. Secondly, I have a question. Did you bottle any of this? I was hoping to keep one bottle as part of commemoration for my time here. I will be at the christening and will hopefully get to partake in the tasting of this brew, and will hopefully get a postcard. But, I was hoping to take a bottle away from it, too. If you could please just let me know if you bottled anything and if so, how much. I can also be reached at Nicholas.Richards@CVN78.navy.mil. Again, thank you. Just sent you an email. Thanks, Nicholas! Would like to be able to purchase some G R Ford items (poster, glassware, 6 pack). Any plans to some Ford merchandise in your store? We do not plan to sell any Gerald R. Ford merchandise items. Is it possible to buy the beer at a retail location? If like to have some to keep. It’s apparent that a lot of people would buy some bottled beer with the Gerald R. Ford label on it. Is it possible that you would reconsider and distribute some? I live in Michigan and my husband and I went to the christening with our son who helped design the carrier and it would be awesome to get some. I did have some on tap while I was there though. Hi Toni! We’re not planning on distributing this product further. We’re glad you were able to enjoy some on tap!